Out in support of last year’s ninth album, Thank You for Today, their first truly new effort since the departure of longtime guitarist and producer Chris Walla, and first since welcoming two new members to their roster, seminal Pacific Northwest indie rockers Death Cab For Cutie are slated to return to The Ryman Auditorium for two nights of performances tonight (Monday) and tomorrow (Tuesday), April 15 and 16, along with underground indie/art pop staple My Brightest Diamond. We loved Death Cab’s Ryman outing last time around, and with an inspired new LP in tow, we’re incredibly excited to welcome the group back once more. Tickets to both performances are still available here (4/15) and here (4/16), and we’d encourage you to snag them quick, then read on for more about the show! 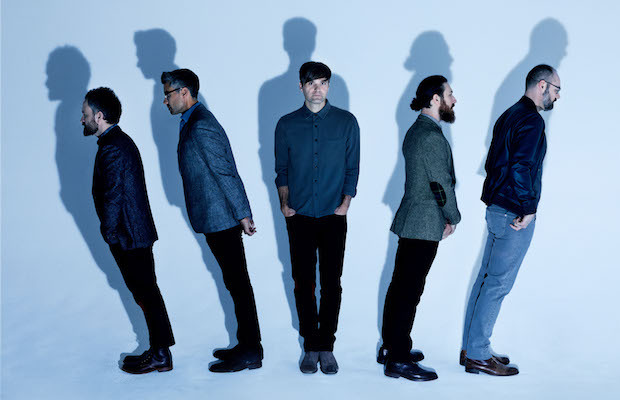 Formed in 1997 in Bellingham, Washington, Death Cab For Cutie initially began as a solo side project for frontman Ben Gibbard, before soon morphing into a proper band. Earning regional buzz, they inked a deal with indie label Barsuk Records by the time of their formal debut, Something About Airplanes, which laid down the prototype for their emotionally laced, indie rooted, pop accessible sound, under the self-sufficient production guidance of guitarist Chris Walla. Death Cab’s first brush with broader success came with third effort The Photo Album in 2001, with single “A Movie Script Ending” especially finding attention in the indie world, but, inarguably, it was 2003’s Transatlanticism, and subsequent 2005 major label debut Plans, that propelled the band to stardom, earned critical and commercial praise, and helped them become a mainstay fixture on the radio, in film and television, and on worldwide tours and festival circuits. Four more LPs, in addition to EPs, live albums, and more, have followed, with the group exploring broader sonic heights, maturing and personal subject matter, and darker and more melancholy soundscapes, all the while finding consistent success and well-received singles. The last few years, especially, have been something of a transitional period for Death Cab. Amidst celebrating the 10 year anniversaries of their two best-known (and, arguably, best) releases, the group announced the departure of Walla a few years back, a fixture not only for his guitar work but his role behind the scenes. Before his exit, the founding member contributed to writing and playing on, but, for the first time, not producing, their 2015 eighth album, Kintsugi, serving as a perfect sonic bridge between the band’s past and present, while helping set the template for a new chapter. With last year’s ninth album, Thank You for Today, recorded in Los Angeles with producer Rich Costey, the group crafted their first truly post-Walla record, welcoming guitarist Dave Depper and keyboard player Zac Rae officially into the fold as full members and part of the creative and recording process, after the pair had previously spent several years helping fill out the band’s live incarnation. The result is one of the most focused, personal, melancholy, and earnest Death Cab albums in years, fitting for a band more than 20 years into their existence, as they naturally settle into legacy as one of the seminal indie acts of the ’00s. Always stellar in concert, The Ryman is an especially great place to see Death Cab For Cutie in concert; don’t miss out! Raised in a family of traveling evangelists, Shara Nova spent her teenage years in the suburbs of Detroit, soaking up the hip hop sounds of early ’90s radio as well as the soul music of the decades prior, all the while formally studying classical music and opera. Though she began making music in college in Texas, and even during a stint in Moscow, it was upon subsequently moving to Brooklyn, where she immersed herself in New York’s avant-garde and underground rock scene, and eventually met and began collaborating with fellow transplant Sufjan Stevens, that the genesis of My Brightest Diamond was born. After time on the road with Stevens, supporting his breakthrough effort Illinois, Nova began performing under her current moniker in ’06, releasing her debut, Bring Me the Workhorse, through Sufjan’s Asthmatic Kitty label. Over a decade of releases, My Brightest Diamond honed a unique fusion of classical chamber music, art pop, and avant-garde rock, touring and collaborating with artists like Sufjan, The Decemberists, and David Byrne along the way. And with her latest, last year’s A Million and One, Shara, who’s since retuned to settle in Detroit, and has tapped into the city’s rich musical history and legacy, as well as its contemporary rebirth, has reinvented herself once more, with her most shimmering, anthemic, and dance-primed pop effort to date. Whether you’ve been following My Brightest Diamond for years or are newly discovering her fantastic catalogue, she’s an inspired choice to support this tour, and an opener worth showing up early for! Death Cab For Cutie and My Brightest Diamond will perform Monday, April 15 and Tuesday, April 16 at The Ryman Auditorium. The shows are all ages, begin at 7:30 p.m., and tickets are available to purchase for $45-75 here (4/15) and here (4/16). Deerhunter live – Bonnaroo Preview?